Ocean Engineering provides a medium for the publication of original research and development work in the field of ocean engineering. 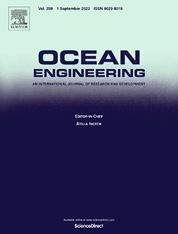 Ocean Engineering seeks papers in the following topics. aquaculture engineering; and subsea engineering. maneuvering and control; and underwater-specific communicating and sensing systems for AUV/ROVs. In these fields, papers on the following technical topics are welcome. Hydrodynamics: CFD; vortex induced vibrations; fluid-structure interaction; hydroelasticity; linear and non-linear wave mechanics; buoyancy and stability; ship resistance and propulsion; seakeeping and controls; ship maneuvering, radiated noise. Structural mechanics: materials; limit state prediction; fatigue; fracture; structural health monitoring; collision and crash worthiness, degradation. Stochastic calculations: stochastic processes; safety and reliability; risk and limit state design. Experimental approaches: instrumentation; full-scale measurements; model tests. Marine equipment: risers; pipelines; ballast water treatment; air emissions treatment; underwater noise mitigation; and associated components or equipment. Ocean environmental predictions- only for ocean structures and vessel operation and design: extreme event predictions; extreme statistics; wave groups; short-term environment predictions; impact of climate change. Note that broader environmental and climate model, sensing, and data sets should be submitted to climate and oceanographic journals. In recognition of the fact that many research and development workers are now entering the area, occasional review articles by leading authorities are also published.